It must have sold out quickly, because here comes the 2009, sourced entirely from the Evergreen vineyard, and the equal of (though not the same as) the astonishing 2009 from Woodward Canyon (previously noted in this blog). Leighton’s Lola is the sort of wine that makes you rethink domestic chardonnay entirely – it is light years beyond the dull, apple-flavored juice, sometimes slathered in new oak, that generally typifies the category. From California I can think only of Peter Michael and Kongsgaard (in my experience) as comparables, and they cost at least three times as much. When first opened, the 2009 Lola had me immediately gushing: “This is as good as the best from California – textural, creamy, a delicious mix of lemon custard, meringue, caramel, papaya and toasted coconut. At one third the price of comparable bottles, this young wine just seduces from the instant it hits the tongue.” Over the course of dinner (salmon and sautéed spinach) and a couple of hours, the wine expanded dramatically, becoming a vinous “candy in a glass” – not sweet, but supremely succulent and satisfying. The only downside is that the Lola chardonnay, along with Efesté’s Babbitt rosé, Tough Guy merlot, Eleni syrah and Emmy (a Rhône blend); are all sold exclusively through the wine club. On a number of occasions over the years, I’ve urged readers to sign up for specific wine clubs before the gates closed. Among them were Abeja, Betz, and Cayuse – all now with long waiting lists. 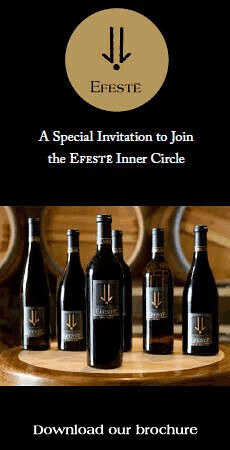 I suggest you join the Efesté Inner Circle wine club while you still can. Brennon's 2009 whites have been amazing. He seems determined to express Evergreen through the full spectrum of white varietals, all of which have this savage character that's awfully compelling. It's quite a match of up-and-coming winemaker and up-and-coming vineyard; certainly one to monitor closely in the years to come.